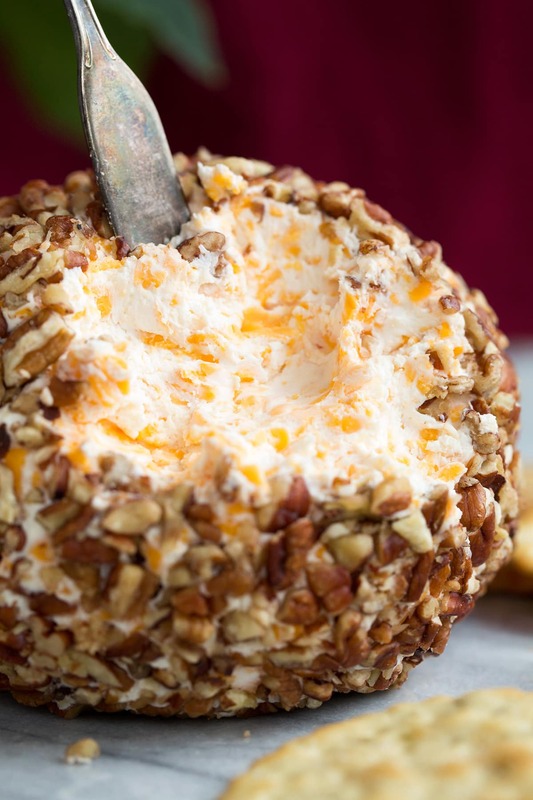 This Cheese Ball is a holiday must ever year! It’s incredibly easy to make and it only requires a few simple ingredients. It has a deliciously creamy texture, it’s brimming with rich and cheesy flavor, and who doesn’t love that nutty pecan finish for a contrasting crunch? 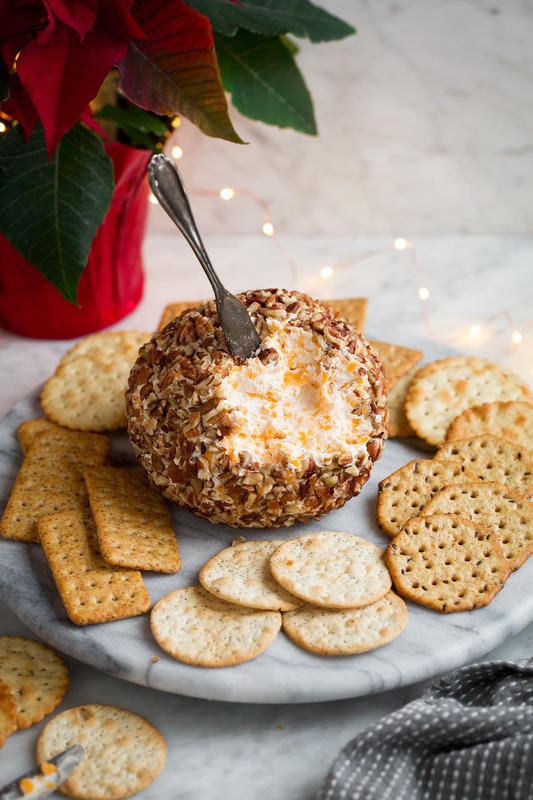 Growing up my mom always made a cheeseball around the holidays and we would polish it off in no time. Not much has changed because now I’m doing the same thing for my family. 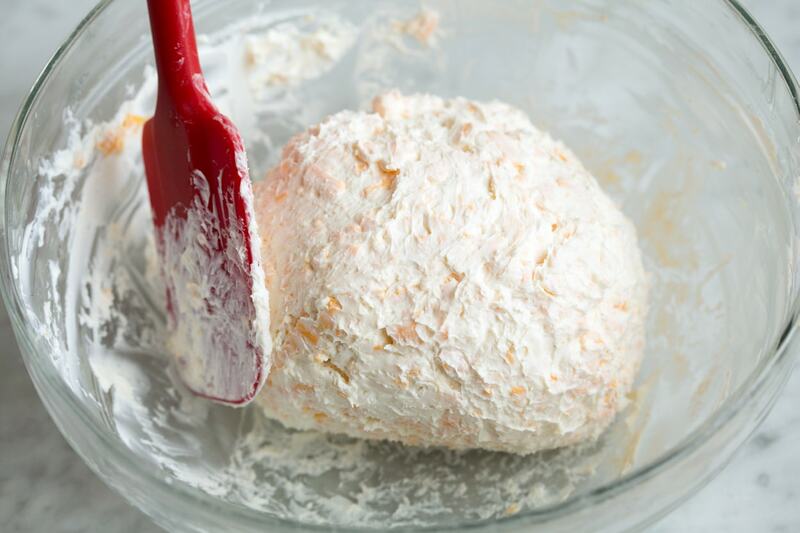 This is my go-to cheese ball recipe. It’s nothing fancy and far cheaper than creating some extravagant cheese board. I’d recommend skipping the salt though, I know normally salt and pepper just go together but there’s already plenty in the ingredients and the crackers you’ll be serving it with. 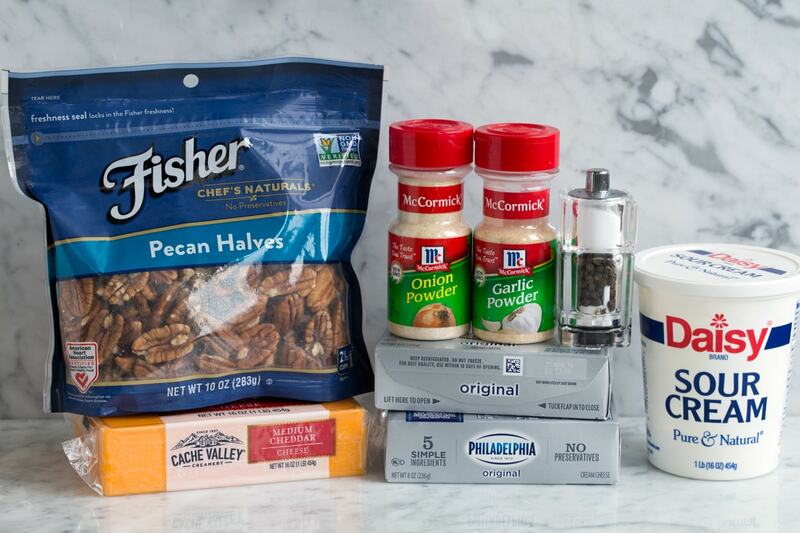 Cream cheese – the key ingredient to a good cheese ball. 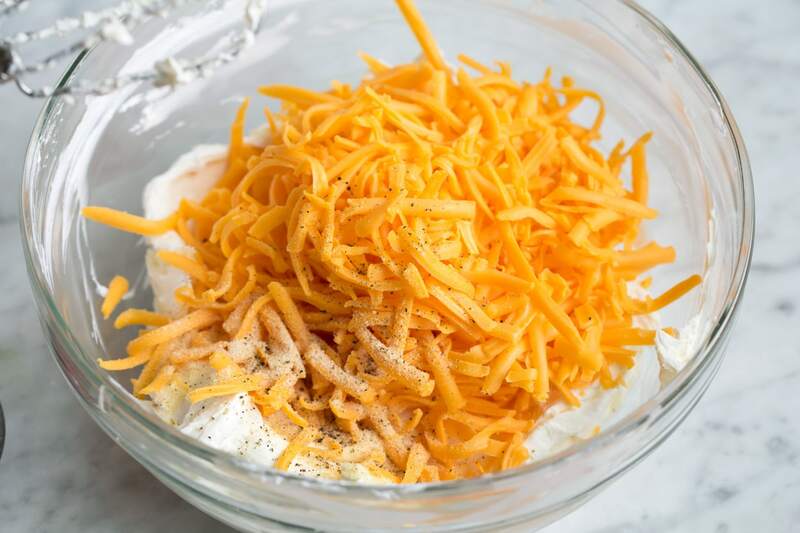 Sour cream – adds extra creaminess and makes it softer. Garlic powder – adds extra flavor. Onion powder – adds extra flavor. Pepper – adds a faint background spice, skip the salt or it will be too salty. Cheddar cheese – cheddar gives it that classic flavor we remember. 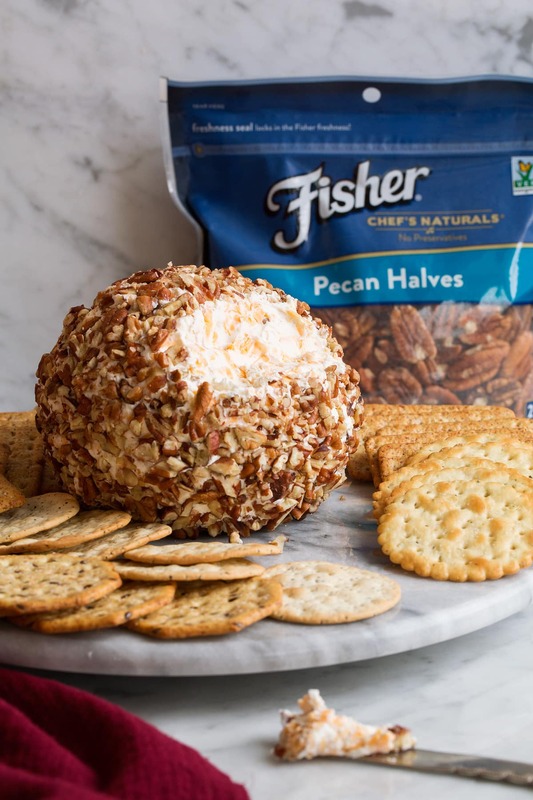 Pecans – the cheese ball would be a mess without these. They add nice crunch too. Add cream cheese, sour, garlic powder and onion powder and pepper to a medium mixing bowl. Mix with an electric hand mixer until smooth. (Sorry I actually added the powders in the next step since I forgot in the first, it will distribute more evenly to add at the beginning). Mix in cheese (with electric mixer). Cover bowl and chill 1 hour to help firm it up. Shape into a ball using a spatula then with greased hands. Place pecans in a medium bowl. 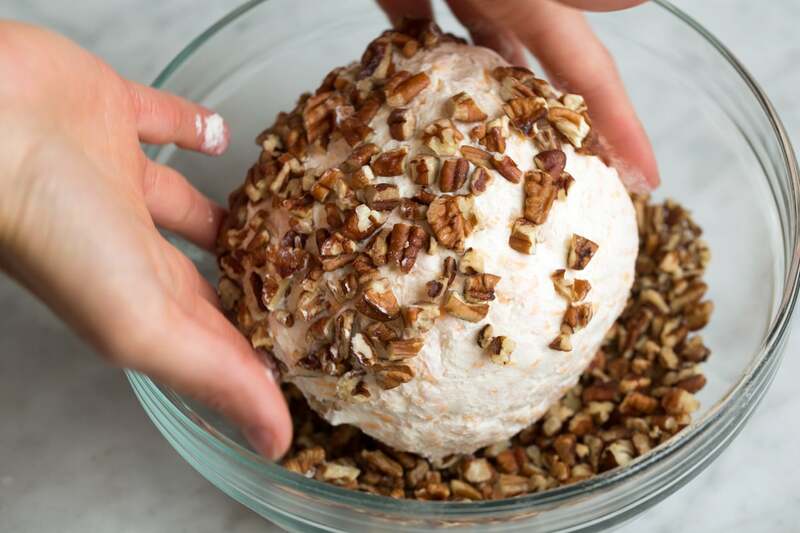 Roll cheese ball through pecans to cover entirely. Serve with crackers, using a butter knife for spreading. Store in refrigerator. How many of us are just tempted to grab one of those cheese balls from the deli? Already made and ready to serve. Skip it. This homemade version is way better! 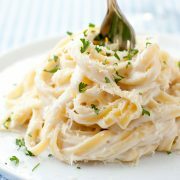 Skip the pre-shredded cheeses here. The freshly shredded has a better flavor and doesn’t have the added powdery coating. Mild or sharp cheddar will work here too if that’s what you prefer. Chop the pecans into small bits, that way they’ll coat better and be better for spreading. Don’t skip the chill step or you likely won’t be able to shape the mixture into a ball. Let it rest at room temperature before serving for a softer consistency. Use a butter knife for spreading. I don’t know why so many of us try to just dive right in with a cracker always to find it broken in half. Can I Mix it By Hand? If you don’t have an electric mixer you could also mix this by hand. 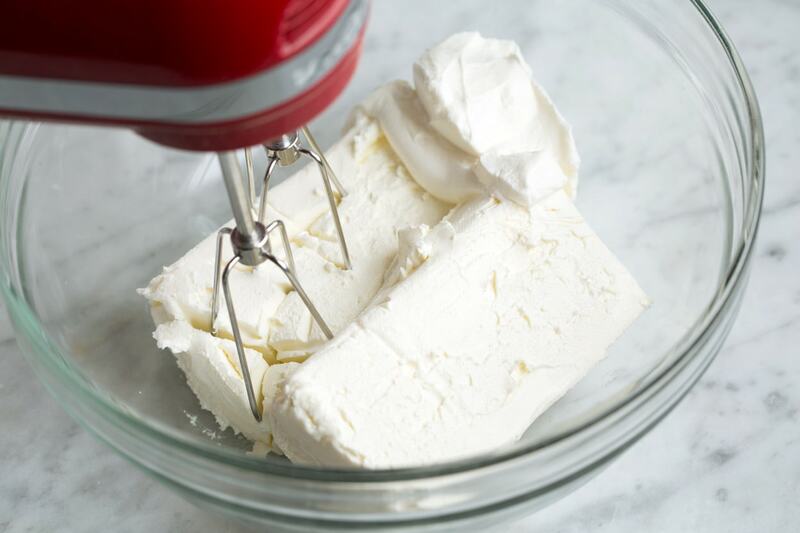 Let the cream cheese soften well then just use a wooden spoon and stir stir stir. How Long Can It Sit Out? Because of the dairy in this for food safety it shouldn’t be left sitting unrefrigerated for longer than two hours. This will keep well refrigerated in an airtight container for 1 week. 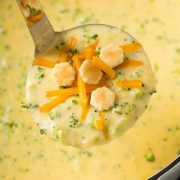 More Delicious Dip Recipes You’ll Love! 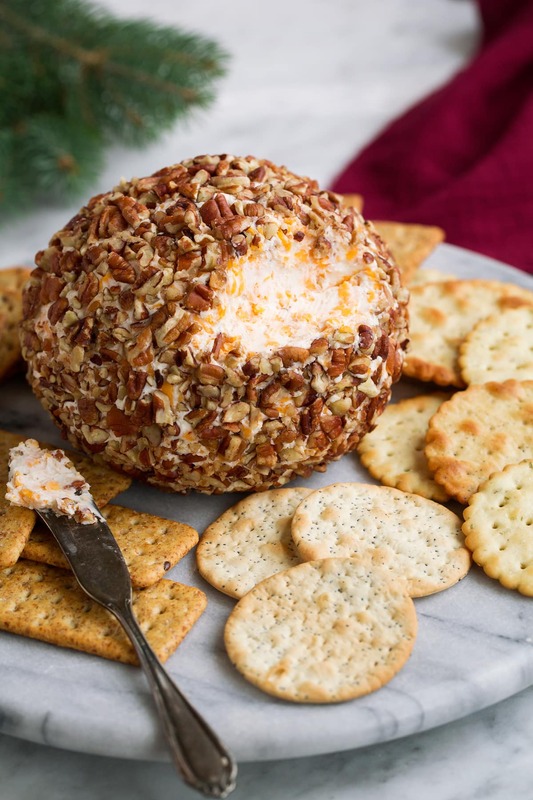 This Cheese Ball is a holiday must ever year! It's incredibly easy to make and it only requires a few simple ingredients. It has a deliciously creamy texture, it's brimming with rich and cheesy flavor, and who doesn't love that nutty pecan finish for a contrasting crunch? Mix in cheese (with electric mixer). Cover bowl and chill 1 hour to help firm it up. It's best to let it rest at room temperature to help it soften up for about 20 minutes. Don't sit at room temperature longer than 2 hours.